This week will see the second ESA bedrest study investigating a mix of antioxidants and vitamins that could help astronauts to combat the side effects of living in space. Ten volunteers will lie in beds with the head end tilted down 6º for 60 days, keeping at least one shoulder on their bed at all times. 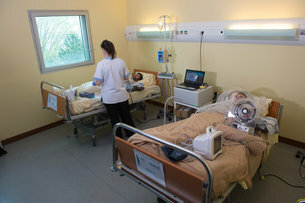 Intense bedrest such is this is no fun: muscles and bones waste away, and the tilted beds makes blood and fluids move to the head – similar to the changes astronauts endure in space. For this study, run by the MEDES space clinic in Toulouse, France, volunteers are testing a vitamin and antioxidant cocktail that was suggested in a call for ideas held in 2011. An earlier 60-day session with 10 other volunteers was held from January to April. Fifteen experiments are being conducted at the same time, with half of the subjects acting as a control group – they will not get the cocktail. Spending 60 days in bed might sound easy, but finding the test subjects is not straightforward. Not only must they remove themselves from their normal daily commitments for 60 days, they also have no privacy and are subjected to rigorous sampling and tests such as muscle biopsies. At the end of their horizontal adventure, they return to standing life weakened and out of shape. To help the subjects regain their fitness, experts from ESA’s astronaut centre in Germany, Cologne, will guide the participants through the same rehabilitation protocol that ESA astronauts follow when returning from the International Space Station. Will the healthy cocktail reduce the inevitable ill effects of not stressing your body for 60 days Researchers will publish their finding after the study. In the meantime, ESA is already preparing for the next bedrest study with NASA, starting in August 2018 at the DLR German Aerospace Center’s ‘:envihab’ facility next to the European Astronaut Centre. For those 60 days, researchers will test the effectiveness of artificial gravity in combating the symptoms of weightlessness by spinning the subjects in a centrifuge while still in bed.